Can I just create a website using bare bones WordPress? Yes, but . . .
What kind of plugins do I need? That depends. There are some excellent guides to setting up a WP blog, and you can build a website in WordPress without using any plugins, but it will lack some of the functionality users have come to expect from a modern site. Plugins allow WordPress to do more and give you more control. Many plugins are free and can be downloaded directly from your WordPress Dashboard. There are thousands of free plugins available for download. Each one has a score, and you can see the number of installations. You then type in your search term to find all the plugins available relating to it. The screenshot above shows SEO plugins. Most plugins make your site load more slowly, so you should think carefully before you install any. Use a site such as GTMetrix.com to check your load speed before and after installing each plugin. 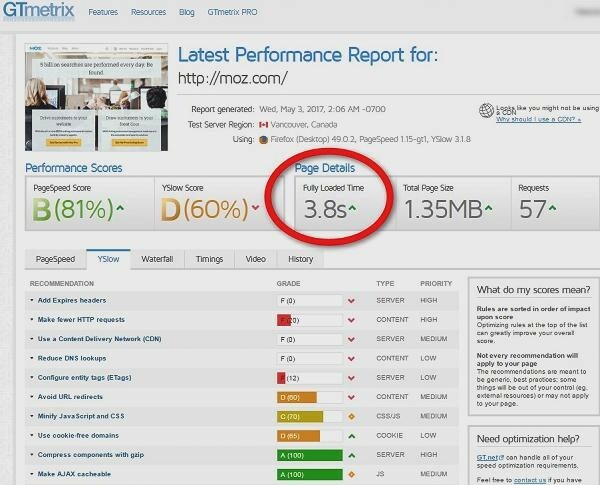 The screenshot above shows the GTMetrix report for Moz.com. The most important aspect here is the Page Load Time. If a plugin increases the page load time, you need to decide if the plugin’s benefits are worth the decrease in your site’s performance. Security is paramount because if someone hacks into our site, they can destroy all your work in a few minutes. Most hacking attempts are automated where a hacker sets up a computer and tries to log into your website over and over using different guesses of your password. 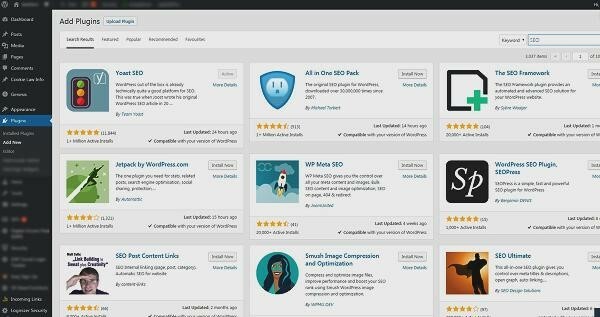 Security plugins limit login attempts from the same computer and help you change default settings, so it is harder for criminals to access your admin dashboard. Loginizer is one simple-to-use plugin that will stop brute force attacks. Every WordPress installation includes two plugins, Hello Dolly and Akismet. You should uninstall and delete Hello Dolly because it serves no practical purpose and slows down your site. Akismet is one of the best anti-spam plugins, and it is already installed. You just need to activate Akismet by registering and entering an API code you receive immediately after registration. WordPress sites all make frequent calls to your website hosting server because every time a site loads various databases need to be accessed. All this takes time and makes your site load more slowly. 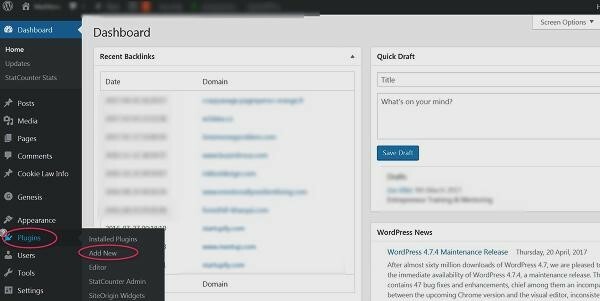 Use a free caching plugin like WP Super Cache to make your pages open faster on visitors’ devices. Speedy sites rank higher in Google. Search engines look for specific data about every page they discover. Site owners often forget to include this data. If you install the free Yoast SEO plugin, you will never forget because there will be a section below each post prompting you for all the essential info. You know you need to back everything up, right? That goes treble for your website. If something goes wrong when you are installing or updating a plugin and your site crashes, you are in a mess unless you have a backup you can install quickly. Updraft is incredibly simple to set up. The free version is good, but the paid version is reasonable and offers excellent value. Updraft includes optional automatic updates before you do anything that might mess up your site. Related posts plugins are great at what they do. They search your database looking for keywords that match a post and then insert links to those related posts on the user’s screen. It all sounds fantastic. However, the slowdown in your page loading speed is unacceptable. You can insert related post links manually, especially when your site is young and has less than one hundred posts. Social media sites are a fact of life. Love them or hate them, you have to play the game. This WPMayor post includes great advice to help you use social media marketing to full effect. It starts with putting social icons on your WordPress site, and you need a plugin to do that. Many of the free social plugins include ads and links to their sites. Worse that that; many are unsupported, sell your browsing history, or slow down your site to the pace of a snail with a hangover. You need to pay for an excellent social media plugin. Social Fans Counter at $19 for the first year and $10 for the second and subsequent years is a great place to start looking. You can build a bare-bones WordPress site, but your site will be better and faster if you use plugins.